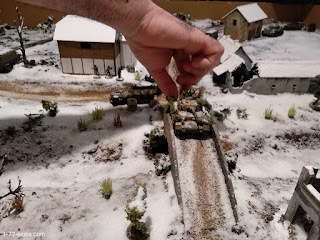 When were looking around for ideas for a Battle of the Bulge campaign last year, we bought a Battlegroup rules downloadable pdf supplement called "Wacht am Rhein" by Warwick Kinrade for gaming the Ardennes from the plasticsolder.co.uk website. 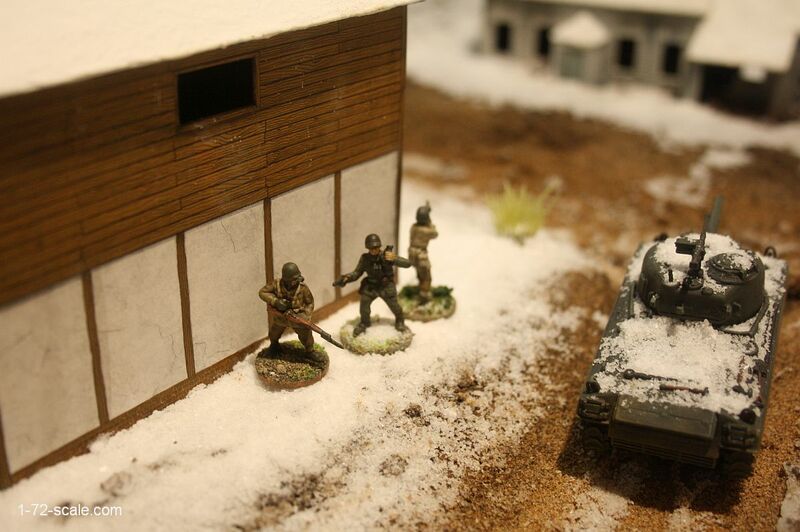 We used a scenario taken from this supplement called "Ambush at Ligneuville". It's based on events that took place on December 17th, when Peiper's spearhead encountered their first serious American resistance as they raced into the village of Ligneuville to secure the small stone bridge over the river Amblève. In the scenario, the Amblève crosses the width of the table east to west across the board with the bridge in the centre. The river is lined with dense bushes, scrub and trees, with various buildings on either side of the bridge. 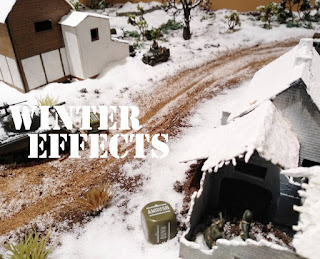 The scenario we used is part of the larger campaign from the book, so a previous game, and this scenario's result are geared to points later in the scenario book's campaign itself. This was just a one-off game, so we kept the scenario's main German objective to secure the Bridge by turn 5. Another of the objectives was to stop the American Brigadier-General "Timberlake" from escaping off the table. 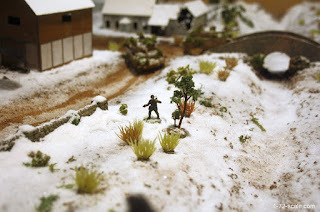 The Americans had to delay the Germans from taking their objective by turn number 5, and in the process either get the Brigadier-General off the table or avoid his capture or elimination. 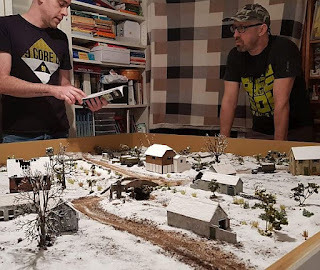 Over the years our group has gamed with various rulesets, all of which have their pros and cons, but we decided that for this new Ardennes campaign we'll be using the Bolt Action rules by Warlord Games which we've found are ok for fast-action skirmish scenarios like this. 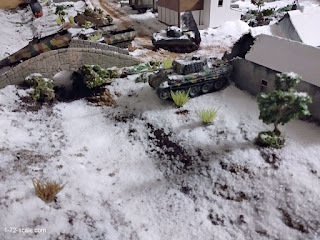 All the vehicles and troops used in the game are as per the published "Ambush at Ligneuvile" scenario, and even though the scenario is geared to the Battlegroup rules, it migrated well for use with Bolt Action. 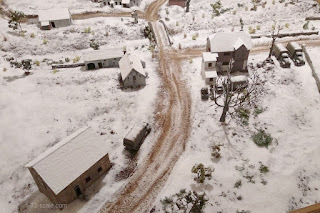 The road leading into the village is the German entry point, top centre is the small stone bridge over the river, and to the left, the large building represents the hotel where the US commander is staying. 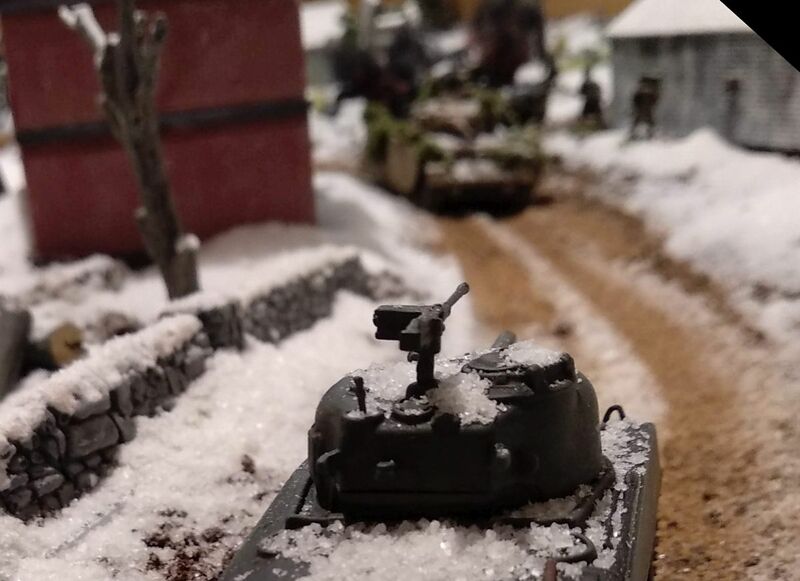 The German spearhead thunders into town via the main road, led by "Obersturmführer" Werner Sternebeck in his Panzer IV passing by parked up transports of the American HQ. Following close behind is a second Panzer IV + two SS Pioneer squads, each in a SdKfz 251. Brigadier-General Timberlake's jeep was parked out in view of the oncoming Panzer IV so he decides to make haste with his two aides out the back door of the hotel and try and escape on foot. The rest of the Americans are some 20 odd rear-echelon troops divided into small rifle and BAR teams, a .30 cal MMG and an M4 Sherman. 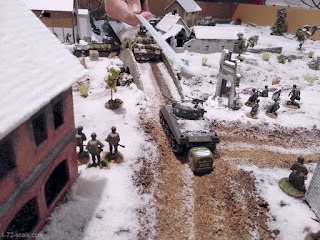 A bazooka team try and take out Sternebeck's Panzer IV. 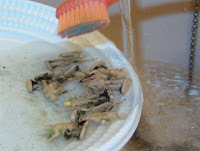 These are green inexperienced troops and miss miserably (also due to a terrible dice throw). 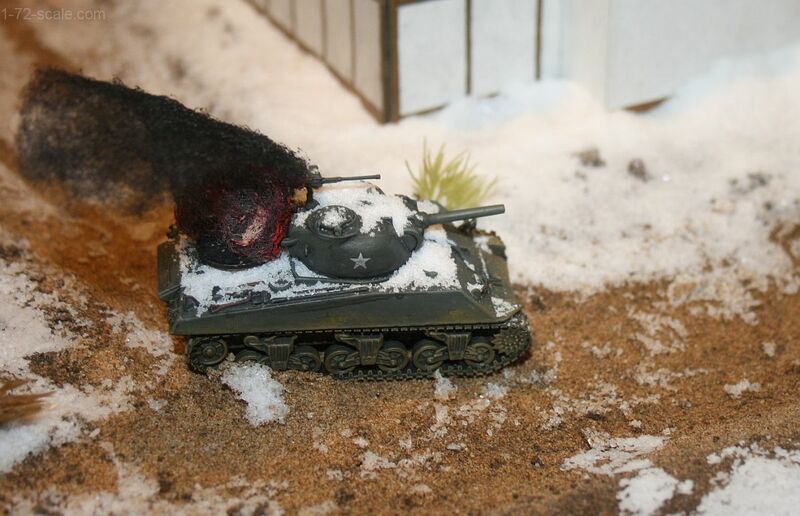 The M4 Sherman also makes a brave attempt to take out the leading Pz IV but misses too. 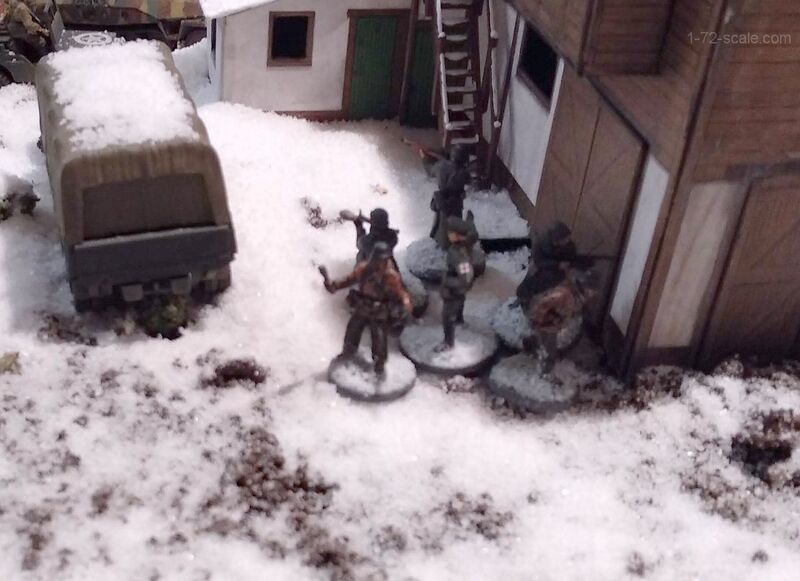 SS pioneers dismount from the leading Sd.Kfz 251 and head away from the road towards the bridge from behind the cover of the building where the bazooka team are lurking. The second group of SS pioneers dismount and take out the Sherman with a well-aimed panzerfaust. Sternebeck's Pz IV blasts at the hidden bazooka team and makes mincemeat of them. 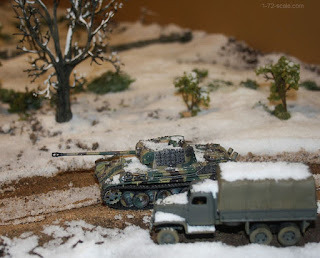 A Panther tank rumbles onto the table from the road and heads toward the bridge following behind the leading tanks. 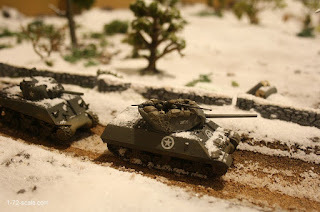 Reinforcements arrive in the form of two Shermans and an M10 Wolverine coming in from the road on the US side of the river. Firefights break out between US troops and the SS pioneers heading on foot toward the bridge. Timberlake meanwhile makes his way through the bushes and rough ground along the riverbank. 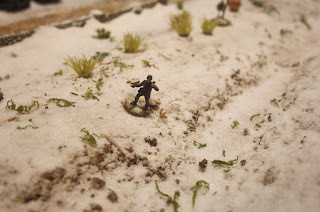 The Germans spray him with machine-gun fire and his two aides fall, leaving him alone. 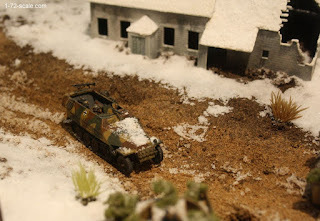 Another German half-track appears on the table on the road toward the village, carrying Peiper himself. 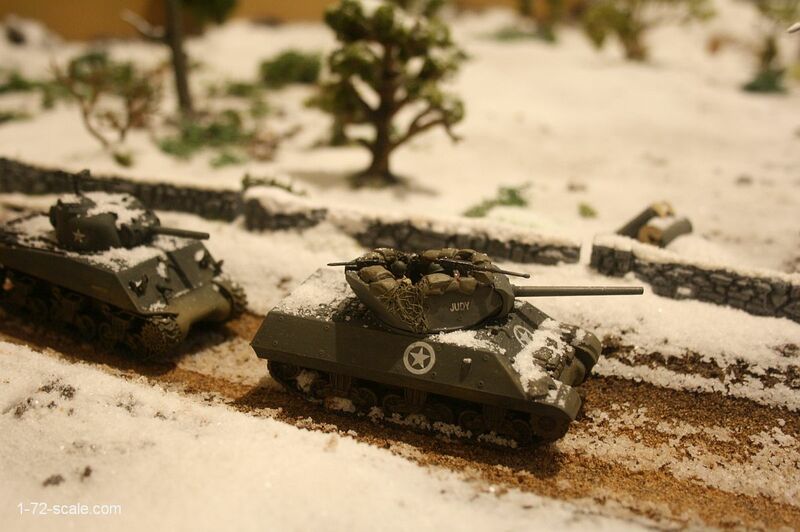 As Sternebeck crosses the bridge he meets a Sherman waiting in the middle of the road on the other side. Both tanks exchange fire, the Sherman hits but fails to penetrate. The Panzer IV returns fire, hits and completely destroys the tank. 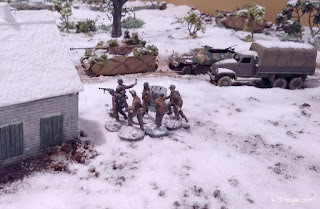 Back on the other side of the river, Timberlake is still pinned in the brush on the riverbank and miraculously escapes unscathed from numerous volleys of shots from the Germans. 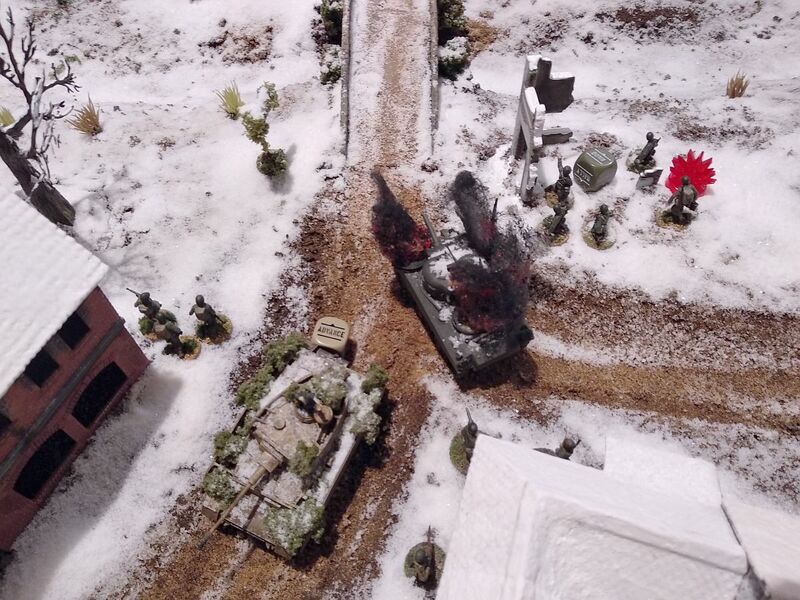 Sternebeck rumbles into town past the burning Sherman. 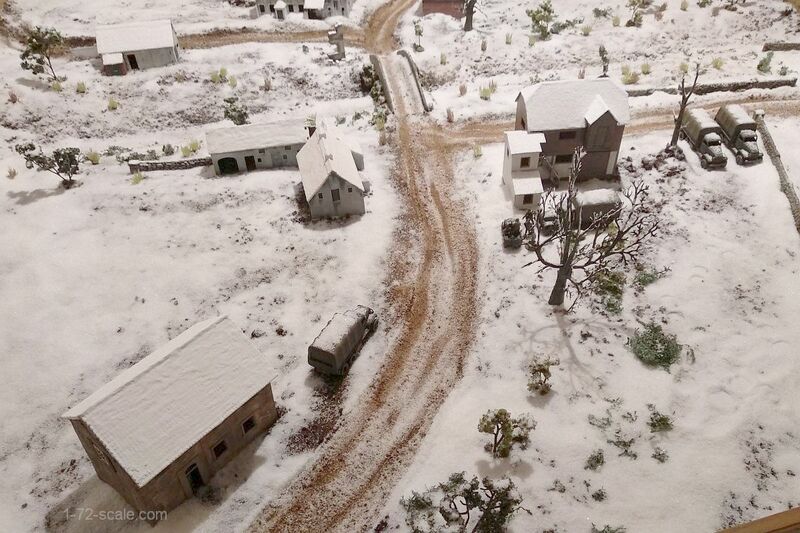 The small groups of green rear-echelon US troops in the surrounding buildings are powerless to stop him. 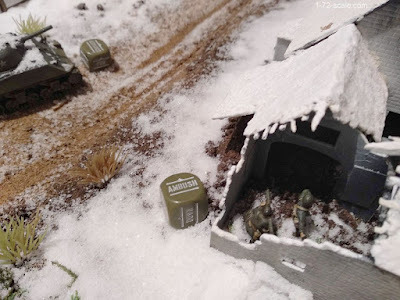 The remaining Sherman and the M10 Wolverine both make a vain attempt to take out Sternebeck's Panzer IV, but the "Dice God" intervenes again and both miss the target completely. 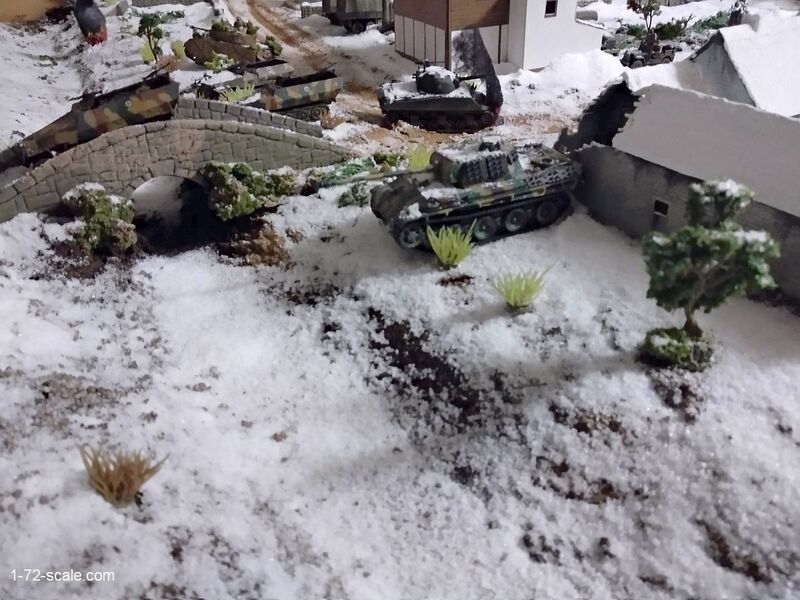 The Pioneers secure the bridge while the Panther gives covering fire from the riverbank. At this point the bridge is now secured and Timberlake, still pinned and unable to escape, finally falls under a hail of fire. 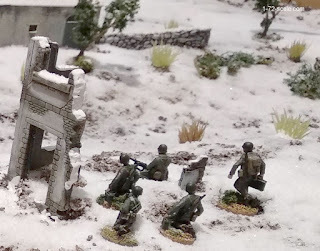 The game played out well, the Germans took the bridge, as they did in reality. 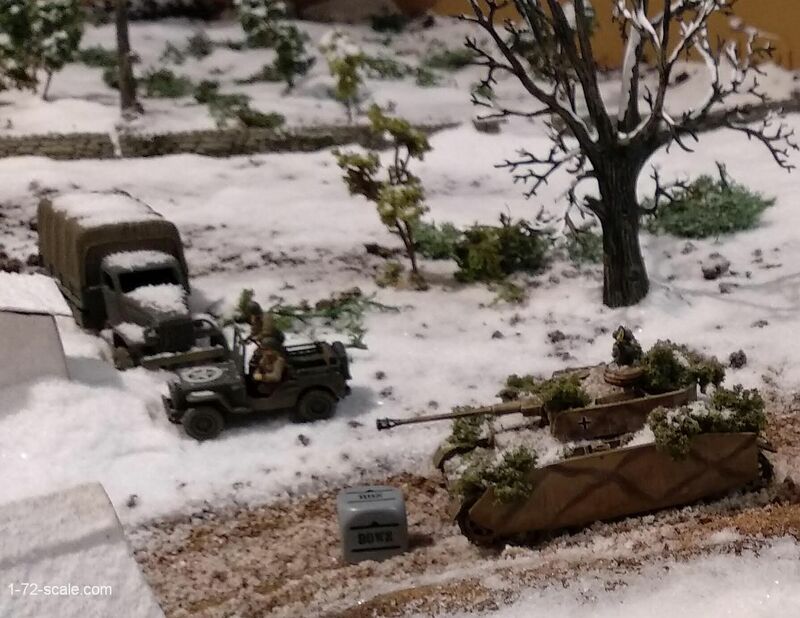 Timberlake didn't escape, though in reality he drove off in his jeep when he heard the German tanks approaching and escaped, The fact that he tried to make it off the table on foot was a big mistake. 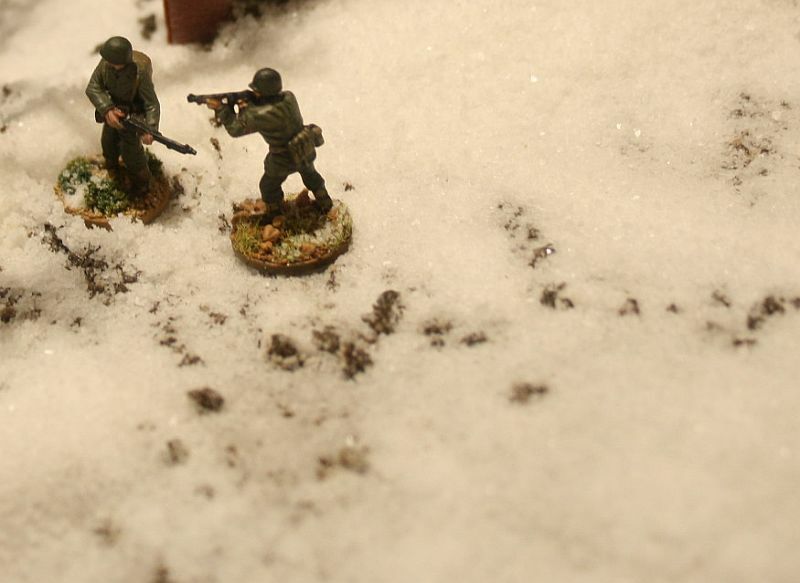 The Americans had the disadvantage of being classed as "green" and the Germans had the positive modifiers associated with SS troops and it was going to be difficult for the Americans to win a decisive victory. That said, the Americans could have at least done a little better, but on this occasion the dice throws meant they didn't have the ability to hit a barn door. Even though we gamed on a heavily snow covered table, when this skirmish took place on 17th December 1944, from all accounts it wasn't snowing at that point in time. The scenario was well written and it plays out well. 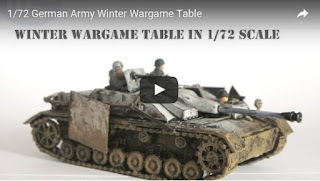 It was easy to use "as is" using all the vehicles and figures mentioned in the scenario, and adapts well to the Bolt Action rules. It would be nice to play again maybe with some other ruleset. All in all, a very enjoyable time with two of my regular gaming mates Alex and Carlos who aptly played the winning Germans.